What’s the best way to climb to the top? Be a failure. If you’re already as successful as you want to be, both personally and professionally, congratulations! Here’s the not-so-good news: All you are likely to get from this article is a semientertaining tale about a guy who failed his way to success. But you might also notice some familiar patterns in my story that will give you confirmation (or confirmation bias) that your own success wasn’t entirely luck. If you’re just starting your journey toward success—however you define it—or you’re wondering what you’ve been doing wrong until now, you might find some novel ideas here. Maybe the combination of what you know plus what I think I know will be enough to keep you out of the wood chipper. Let me start with some tips on what not to do. Beware of advice about successful people and their methods. For starters, no two situations are alike. Your dreams of creating a dry-cleaning empire won’t be helped by knowing that Thomas Edison liked to take naps. Secondly, biographers never have access to the internal thoughts of successful people. If a biographer says Henry Ford invented the assembly line to impress women, that’s probably a guess. But the most dangerous case of all is when successful people directly give advice. For example, you often hear them say that you should “follow your passion.” That sounds perfectly reasonable the first time you hear it. Passion will presumably give you high energy, high resistance to rejection and high determination. Passionate people are more persuasive, too. Those are all good things, right? Here’s the counterargument: When I was a commercial loan officer for a large bank, my boss taught us that you should never make a loan to someone who is following his passion. For example, you don’t want to give money to a sports enthusiast who is starting a sports store to pursue his passion for all things sporty. That guy is a bad bet, passion and all. He’s in business for the wrong reason. For most people, it’s easy to be passionate about things that are working out, and that distorts our impression of the importance of passion. I’ve been involved in several dozen business ventures over the course of my life, and each one made me excited at the start. You might even call it passion. The ones that didn’t work out—and that would be most of them—slowly drained my passion as they failed. The few that worked became more exciting as they succeeded. For example, when I invested in a restaurant with an operating partner, my passion was sky high. And on day one, when there was a line of customers down the block, I was even more passionate. In later years, as the business got pummeled, my passion evolved into frustration and annoyance. On the other hand, Dilbert started out as just one of many get-rich schemes I was willing to try. When it started to look as if it might be a success, my passion for cartooning increased because I realized it could be my golden ticket. In hindsight, it looks as if the projects that I was most passionate about were also the ones that worked. But objectively, my passion level moved with my success. Success caused passion more than passion caused success. So forget about passion. And while you’re at it, forget about goals, too. Throughout my career I’ve had my antennae up, looking for examples of people who use systems as opposed to goals. In most cases, as far as I can tell, the people who use systems do better. The systems-driven people have found a way to look at the familiar in new and more useful ways. To put it bluntly, goals are for losers. That’s literally true most of the time. For example, if your goal is to lose 10 pounds, you will spend every moment until you reach the goal—if you reach it at all—feeling as if you were short of your goal. In other words, goal-oriented people exist in a state of nearly continuous failure that they hope will be temporary. If you achieve your goal, you celebrate and feel terrific, but only until you realize that you just lost the thing that gave you purpose and direction. Your options are to feel empty and useless, perhaps enjoying the spoils of your success until they bore you, or to set new goals and re-enter the cycle of permanent presuccess failure. I have a friend who is a gifted salesman. He could have sold anything, from houses to toasters. The field he chose (which I won’t reveal because he wouldn’t appreciate the sudden flood of competition) allows him to sell a service that almost always auto-renews. In other words, he can sell his service once and enjoy ongoing commissions until the customer dies or goes out of business. His biggest problem in life is that he keeps trading his boat for a larger one, and that’s a lot of work. Observers call him lucky. What I see is a man who accurately identified his skill set and chose a system that vastly increased his odds of getting “lucky.” In fact, his system is so solid that it could withstand quite a bit of bad luck without buckling. How much passion does this fellow have for his chosen field? Answer: zero. What he has is a spectacular system, and that beats passion every time. As for my own system, when I graduated from college, I outlined my entrepreneurial plan. The idea was to create something that had value and—this next part is the key—I wanted the product to be something that was easy to reproduce in unlimited quantities. I didn’t want to sell my time, at least not directly, because that model has an upward limit. And I didn’t want to build my own automobile factory, for example, because cars are not easy to reproduce. I wanted to create, invent, write, or otherwise concoct something widely desired that would be easy to reproduce. My system of creating something the public wants and reproducing it in large quantities nearly guaranteed a string of failures. By design, all of my efforts were long shots. Had I been goal-oriented instead of system-oriented, I imagine I would have given up after the first several failures. It would have felt like banging my head against a brick wall. But being systems-oriented, I felt myself growing more capable every day, no matter the fate of the project that I happened to be working on. And every day during those years I woke up with the same thought, literally, as I rubbed the sleep from my eyes and slapped the alarm clock off. If you drill down on any success story, you always discover that luck was a huge part of it. You can’t control luck, but you can move from a game with bad odds to one with better odds. You can make it easier for luck to find you. The most useful thing you can do is stay in the game. If your current get-rich project fails, take what you learned and try something else. Keep repeating until something lucky happens. The universe has plenty of luck to go around; you just need to keep your hand raised until it’s your turn. It helps to see failure as a road and not a wall. I’m an optimist by nature, or perhaps by upbringing—it’s hard to know where one leaves off and the other begins—but whatever the cause, I’ve long seen failure as a tool, not an outcome. I believe that viewing the world in that way can be useful for you too. Becoming stronger is obviously a good thing, but it’s only barely optimistic. I do want my failures to make me stronger, of course, but I also want to become smarter, more talented, better networked, healthier and more energized. If I find a cow turd on my front steps, I’m not satisfied knowing that I’ll be mentally prepared to find some future cow turd. I want to shovel that turd onto my garden and hope the cow returns every week so I never have to buy fertilizer again. Failure is a resource that can be managed. Before launching Dilbert, and after, I failed at a long series of day jobs and entrepreneurial adventures. Here are just a few of the worst ones. I include them because successful people generally gloss over their most aromatic failures, and it leaves the impression that they have some magic you don’t. When you’re done reading this list, you won’t have that delusion about me, and that’s the point. Success is entirely accessible, even if you happen to be a huge screw-up 95% of the time. Velcro Rosin Bag Invention: In the 1970s, tennis players sometimes used rosin bags to keep their racket hands less sweaty. In college, I built a prototype of a rosin bag that attached to a Velcro strip on tennis shorts so it would always be available when needed. My lawyer told me it wasn’t patentworthy because it was simply a combination of two existing products. I approached some sporting-goods companies and got nothing but form-letter rejections. I dropped the idea. But in the process I learned a valuable lesson: Good ideas have no value because the world already has too many of them. The market rewards execution, not ideas. From that point on, I concentrated on ideas that I could execute. I was already failing toward success, but I didn’t yet know it. Gopher Offer: During my banking career, in my late 20s, I caught the attention of a senior vice president at the bank. Apparently my b.s. skills in meetings were impressive. He offered me a job as his gopher/assistant with the vague assurance that I would meet important executives during the normal course of my work, which would make it easy for him to strap a rocket to my backside—as the saying roughly went—and launch me up the corporate ladder. On the downside, the challenge would be to survive his less-than-polite management style and do his bidding for a few years. I declined his offer because I was already managing a small group of people, so becoming a gopher seemed like a step backward. I believe the senior vice president’s exact characterization of my decision was “[expletive] STUPID!! !” He hired one of my co-workers for the job instead, and in a few years that fellow became one of the youngest vice presidents in the bank’s history. I worked for Crocker National Bank in San Francisco for about eight years, starting at the very bottom and working my way up to lower management. During the course of my banking career, and in line with my strategy of learning as much as I could about the ways of business, I gained an extraordinarily good overview of banking, finance, technology, contracts, management and a dozen other useful skills. I wouldn’t have done it any differently. Webvan: In the dot-com era, a startup called Webvan promised to revolutionize grocery delivery. You could order grocery-store items over the Internet, and one of Webvan’s trucks would load your order at the company’s modern distribution hub and set out to service all the customers in your area. I figured Webvan would do for groceries what Amazon had done for books. It was a rare opportunity to get in on the ground floor. I bought a bunch of Webvan stock and felt good about myself. When the stock plunged, I bought some more. I repeated that process several times, each time licking my lips as I acquired ever-larger blocks of the stock at prices I knew to be a steal. When the company announced that it had achieved positive cash flow at one of its several hubs, I knew that I was onto something. If it worked in one hub, the model was proved, and it would surely work at others. I bought more stock. Now I owned approximately, well, a boatload. A few weeks later, Webvan went out of business. Investing in Webvan wasn’t the dumbest thing I’ve ever done, but it’s a contender. The loss wasn’t enough to change my lifestyle. But boy, did it sting psychologically. In my partial defense, I knew it was a gamble, not an investment per se. What I learned from that experience is that there is no such thing as useful information that comes from a company’s management. Now I diversify and let the lying get smoothed out by all the other variables in my investments. These failures are just a sampling. I’m delighted to admit that I’ve failed at more challenges than anyone I know. As for you, I’d like to think that reading this will set you on the path of your own magnificent screw-ups and cavernous disappointments. You’re welcome! And if I forgot to mention it earlier, that’s exactly where you want to be: steeped to your eyebrows in failure. 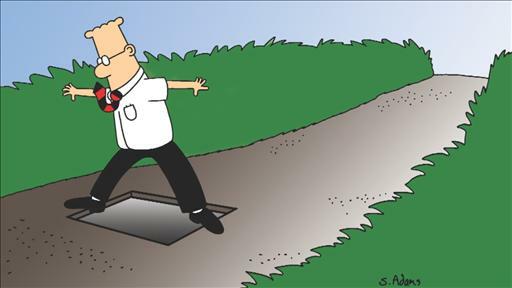 Mr. Adams is the creator of Dilbert. Adapted from his book “How to Fail at Almost Everything and Still Win Big,” to be published by Portfolio, a member of Penguin Group (USA), on Oct. 22. A version of this article appeared October 11, 2013, on page C1 in the U.S. edition of The Wall Street Journal, with the headline: Fail Your Way to Success.